I have been using Full Spectrum Turmeric Extract for some time and I notice a difference in my pain levels when I come off it for a few days. I take one three times daily. 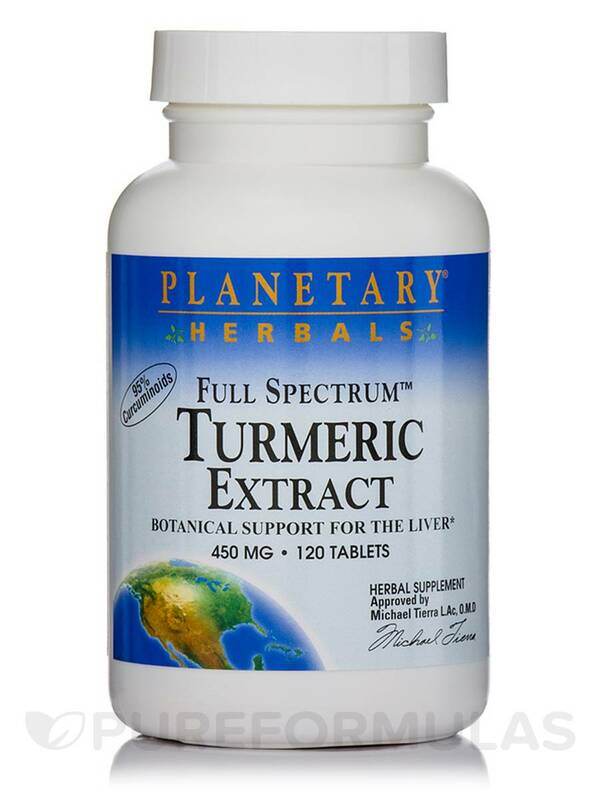 Full Spectrum™ Turmeric Extract 450 mg 120 Tablets from Planetary Herbals may provide antioxidant support to the body. 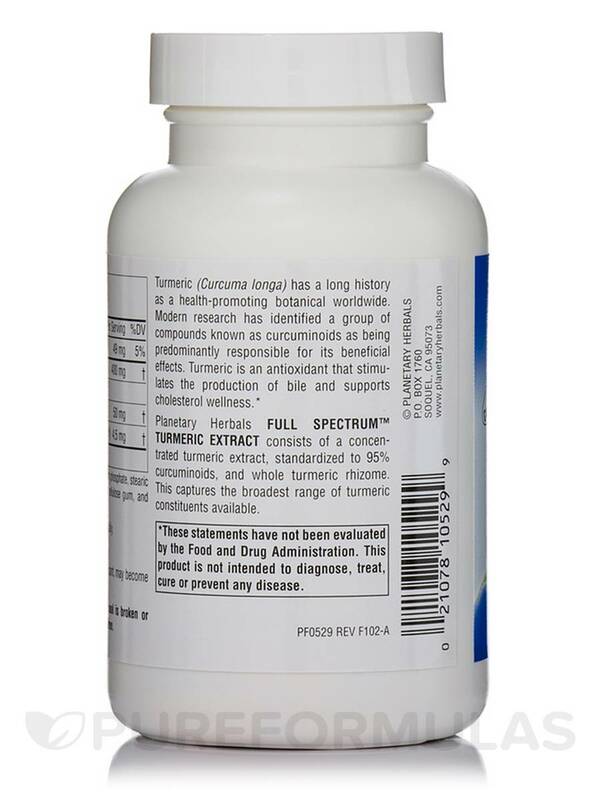 Curcuma longa or turmeric is related to ginger and is grown throughout India‚ Asia‚ and Africa. Commonly used in Asian cuisine‚ ginger is slowly finding its way into Western cooking. Since it is still not a popular ingredient here‚ it may be easier to use in the form of this supplement from Planetary Herbals. The main component of turmeric is called curcumin and it gives turmeric the distinct yellow color and its antioxidant properties. Antioxidants help maintain cellular health and fight the disease-causing molecules called free radicals. The curcuminoids in the turmeric extract might also have anti-inflammatory properties that could benefit the liver. The supplement from Planetary Herbals contains piperine‚ the active ingredient of black pepper that may help the assimilation of turmeric by the body. 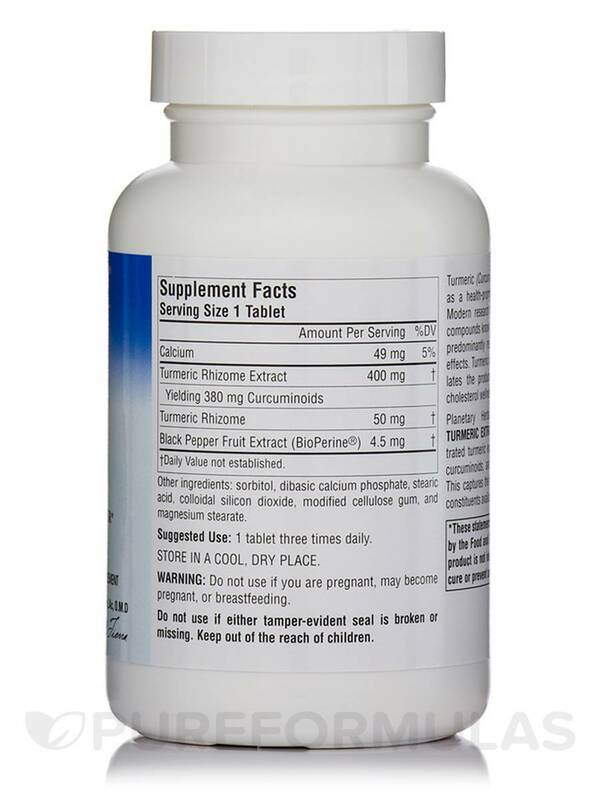 Full Spectrum™ Turmeric Extract 450 mg 120 Tablets from Planetary Herbals contains concentrated turmeric extract‚ which is standardized to 95% curcuminoids‚ and whole turmeric rhizome for maximum benefits. Sorbitol‚ dibasic calcium phosphate‚ stearic acid‚ silica‚ modified cellulose gum‚ and magnesium stearate. Great value compared to other ones. I like that Full Spectrum Turmeric by Planetary Herbals has a pepper extract already so that absorption is increased. Others lack this ingredient. Great for a multitude of uses, I've been taking this for general antioxidant support and its anti-inflammatory properties. I had some issues with inflammation and this has been helping me I believe. Also great for those looking for liver support or those that exercise at high intensities.